29 million Magicbands have been distributed at the Walt Disney Resort, which is a staggering number of wearables. This puts Disney as the number 4 in the world when it comes to wearables. Having used a Magicband myself last year, I see how it has grown that big. You can use your Magicband for almost anything at the resort and that makes it as well that people want to customize them. Just now Disney introduces Solid-Color Magicbands. The solid-color MagicBand 2 are now available in the current eight colors – pink, blue, red, green, orange, gray, yellow, and purple – wherever MagicBands are sold throughout Walt Disney World Resort. Passholders are already enjoying these new Magicband. And guests staying at a Walt Disney Resort will receive the new ones in the mail soon. Also being introduced today are the Magickeeper Accesoires. Giving you even more options to customize. 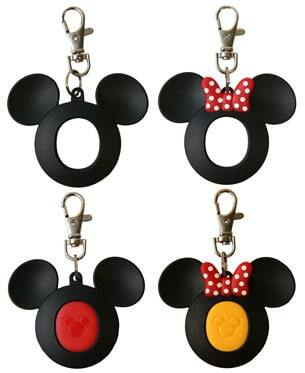 You can put the center icon into a silver carabiner to wear on a purse, diaper bag or belt loop; or into a Mickey Mouse or Minnie Mouse lanyard clip to wear around your neck.